The holiday magic is virtual. The emotion is real. How Honda used VR to bring joy to children in the hospital during the holidays. The holidays should be a magical time. But for children in the hospital, it can be an especially tough time. One of the most amazing aspects of Virtual Reality technology is its ability to create the emotion and feeling of an actual experience, even though you haven't really gone anywhere. That's why Honda and RPA decided to bring an experience of holiday cheer to the kids at Children's Hospital of Orange County, through an immersive journey down a virtual Candy Cane Lane via an Oculus headset. And there was an extra-special surprise for the kids at the end of the street. We documented how it all went and shared the video on our social channels. Keep your tissues handy. Want to see what the children saw? You can view the 360 video on YouTube here. The response from the children was incredible. But equally wonderful were the responses after people watched the video. It's the rare opportunity in the advertising industry that allows us to create something beautiful, without talking about our product at all, yet still results in people loving the brand even more. 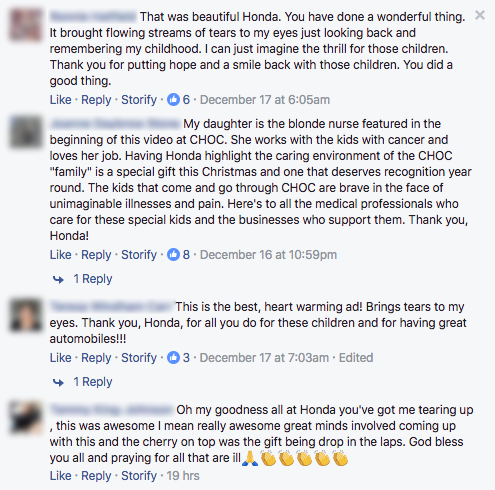 For every "like" or "love" that the video receives on Facebook, Honda will donate a dollar to CHOC Children's and the Pediatric Brain Tumor Foundation, up to a total of $100,000. This effort was part of the annual "Happy Honda Days" campaign, which is all about tapping into the nostalgia and joy of the holidays.